LOGAR PROVINCE, Afghanistan --- The Unmanned Aerial System Platoon with Company B, 4-3 Brigade Special Troops Battalion, 4th Infantry Brigade Combat Team, 3rd Infantry Division, is on pace to fly their Shadow unmanned aircraft more than 2,000 hours more than their predecessors at Forward Operating Base Shank, Afghanistan. The platoon has flown more than 3,800 hours across 600 plus flights. “My goal is 5,000 hours,” said U.S. Army 2nd Lt. Mark McConnell, a Lake Hopatcong, N.J. native and the platoon’s leader. The three previous UAS platoons that served at Forward Operating Base Shank flew an average of 2,900 hours with the same number of aircraft. Their mission is to collect intelligence and conduct surveillance in support of Task Force Vanguard as they help develop the Afghan National Security Forces and secure a key highway in Wardak province, Afghanistan. The Shadow unmanned aircraft, manufactured by AAI Corporation, is capable of flying for six to nine hours and provides over watch for soldiers on the ground. The full motion video feed gives commanders on the ground, and in tactical operations centers, a real-time picture of the battlefield. McConnell, a 23-year-old all-source intelligence officer, took command of the platoon upon deployment and couldn’t be more proud of the soldiers in the unit. “They’re great noncommissioned officers - proactive and professional who can work through issues and run an excellent maintenance program,” he said. Being able to fly so many hours means giving commanders a reliable “eye in the sky” that can respond when troops are in contact with the enemy. U.S. Army Sgt. Carl Brown, originally from Victorville, Calif., is the platoon’s standardization operator. He is responsible for managing the platoon’s training as well as advising McConnell on UAS operations. The platoon trained for the deployment at Evans Army Airfield, Ga., by flying two weeks each month. A training rotation to the Joint Readiness Training Center at Fort Polk, La., provided realistic training and was very helpful in preparing the unit for deployment, said Brown. Brown, a career soldier with a wife and daughter back home at Fort Stewart, Ga., credits the unit’s teamwork for their success. The platoon, a mix of soldiers and civilian contractors, was able to reach the high level of flying hours by closely managing their crew-rest procedures. UAS operators are required to have a certain amount of rest to ensure their ability to safely operate the aircraft. 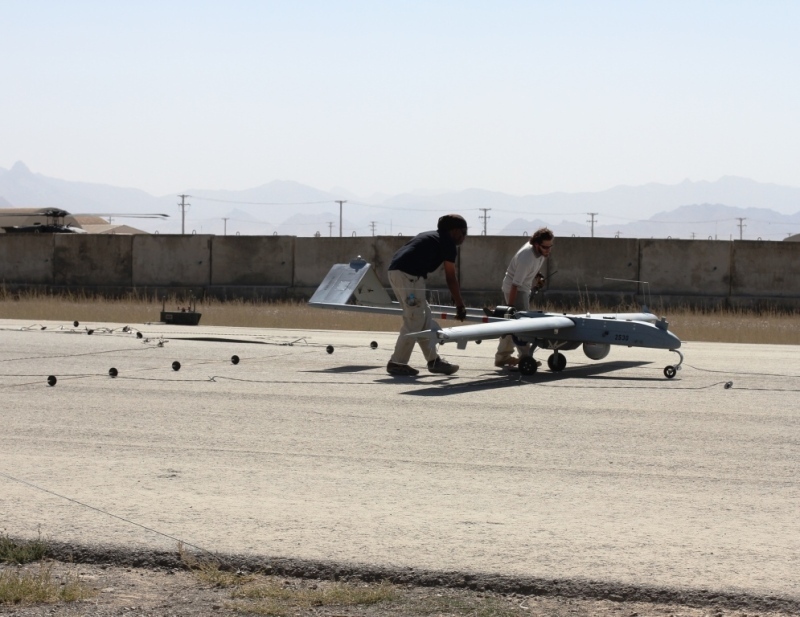 Most UAS platoons take a day off every two weeks for crew rest. McConnell and his team managed their operators rest on an individual basis, meaning their Shadows were up and flying 24/7 with no down time. Over their nine-month deployment, that adds up to hundreds of flying hours. McConnell said their maintenance program, ability to trouble-shoot problems and flying the Shadow to the limit of its capability contibuted to their success. There are two versions of the Shadow. The increased endurance version has longer wings which means more fuel and a 50 percent increase in flight time. McConnell worked with AAI contractors to upgrade his fleet, replacing three of the UAVs with the long-wing versions. The longer flight time equals fewer launches and recoveries and reduced downtime. McConnell also credits his operators experience and professionalism for the exceptionally low number of safety incidents they’ve experienced. Any safety incident requires an investigation and results in lost flight time. Keeping incidents low is another reason we’ve been able to amass so many flight hours, he added. 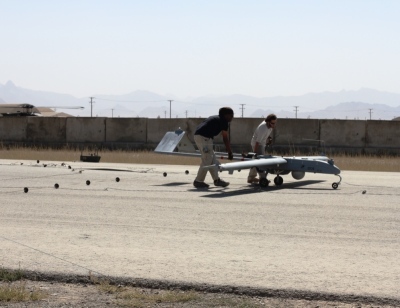 The 4th Brigade, 3rd Infantry Division’s intelligence officer, Maj. Randy Gable, oversees the implementation of the UAS. They’ve been very responsive to a changing mission and their ability to provide 24/7 coverage is a feat in itself, he said. U.S. Army Warrant Officer Jonathan Adams, the platoon’s technical expert, implemented a very proficient maintenance schedule, added Gable. McConnell and Brown are both looking forward to heading home in a few months and plan to have some much deserved fun. “We’re planning a trip to Disneyworld,” said Brown. “The first thing I’m doing when we get back is going to the Jefferson [N.J. Diner and having a huge breakfast at midnight,” said McConnell.